By revealing underlying assumptions that influence the field of psychology, The Hidden Worldviews of Psychology’s Theory, Research, and Practice challenges psychologists to reconsider the origins of ideas they may take as psychological truths. Worldviews, or the systems of assumptions that provide a framework for psychological thinking, have great influence on psychological theory, research, and practice. 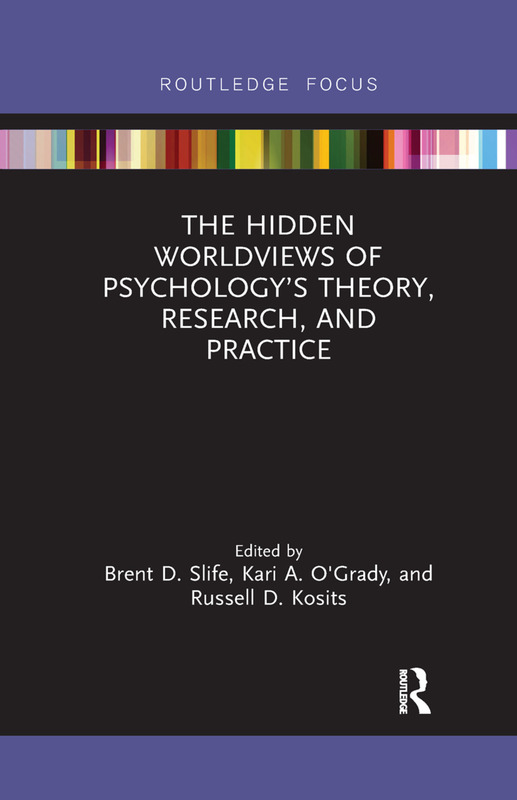 This book attempts to correct assumptions by describing the worldviews that have shaped psychological theory, practice, and research and demonstrating how taking worldviews into account can greatly advance psychology as a whole. "A duty of theoretical and philosophical psychology is to expand the boundaries of the discipline, profession, and our horizons. This book impressively accomplishes this task by focusing on the relevance of unquestioned worldviews in theory and practice. Karl Jaspers would have been intrigued." —Thomas Teo, Professor in the History of Theory of Psychology Program, York University, Canada. Brent D. Slife is Professor of Psychology, Brigham Young University, USA and the present Editor-in-Chief of the APA Journal of Theoretical and Philosophical Psychology. He has authored over 200 articles and 10 books, and continues his psychotherapy practice of over 30 years. Kari A. O’Grady is Associate Professor of Psychology and Pastoral Counseling, Loyola University Maryland, USA. She is the director for the Center for Trauma Studies and Resilience Leadership. Russell D. Kosits is Associate Professor and Chair of Psychology, Redeemer University College, Canada.